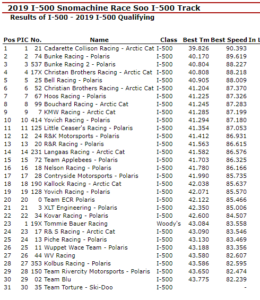 Troy DeWald Sets The Pace After Two Rounds Of I-500 Qualifying. SAULT STE. MARIE, MI – Jan. 29, 2019 – Troy DeWald improved on his quick lap from earlier this afternoon to hang on to the top spot after two rounds of 51st Annual International 500 Snowmobile Race Qualifying. 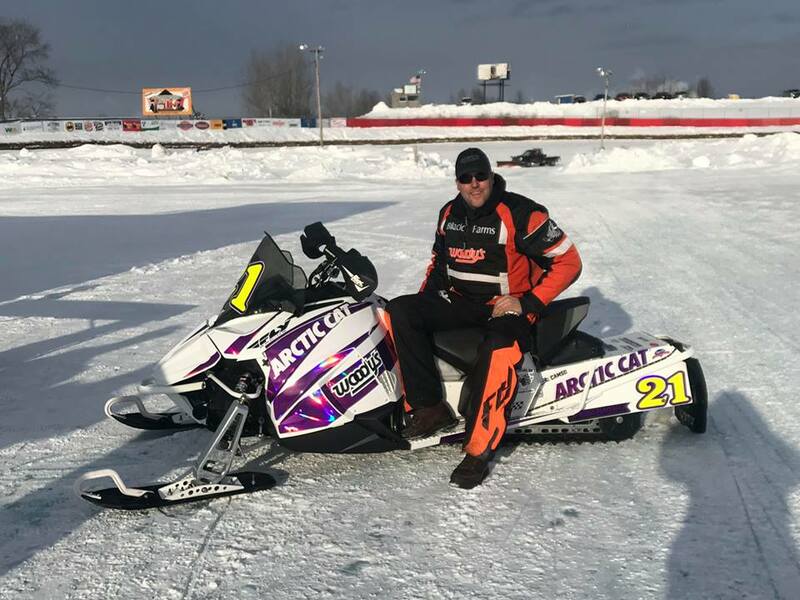 The 49-year-old from AuGres, MI lowered his fast time to a 39.647 = 90.801mph aboard his #21 Cadarette Collision Racing / Arctic Cat entry. Seven-Time International 500 Snowmobile Race Winner, Gabe Bunke is second quick as 19-year-old Luke Krentz, Defending #SooI500 Winner, Zach Herfindahl & Ryan Faust Racing were the top five. Earlier in the afternoon, DeWald started the day off by turning in a 39.826. The two Bunke Racing entries were second & third with G. Bunke and Ryan Faust respectively. Herfindahl was fourth as Rodney Bell completed the top five after the first round. In Woody’s Challenge Round I Qualifying, G. Bunke timed in the quickest at a 39.942 = 90.131mph. 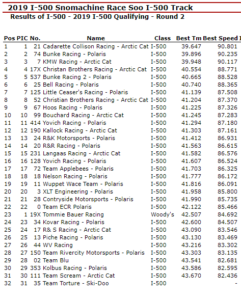 Krentz was second fastest while DeWald, Herfindahl & Ross Erdman were the top five. The 3rd running of the Brad Redman Memorial for the Great Lakes Antique Snowmobile Series is next on Wednesday, January 30. 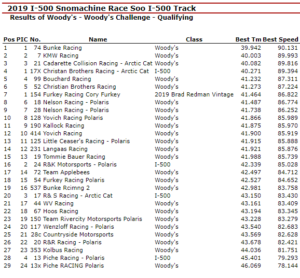 Additionally, there’s two more rounds of #SooI500 Qualifying and the second of three rounds of Woody’s Challenge Qualifying as well.